When designing the OutThere kits, I worked really hard and spent countless hours to find items that would make the kit as small as possible. But somehow the fact that a full travel tube of toothpaste was included instead of a smaller amount escaped me. A travel size tube is more than enough for at least 10 days of camping. The idea for repackaging the toothpaste into a smaller container came from Chad over at sticksblog.com when he did his review of the kits. Thanks Chad for kickstarting this idea. Repackaging toothpaste is a quick 10 minute project that can save you both space and weight in your kit. The technique will work with toothpaste, sunscreen, soap, hand sanitizer, cooking sauces, or any other liquid or cream that you carry. After loading toothpaste into the dropper bottle, the toothpaste was very very difficult to squeeze out of the tip because of a thin little divider that was in the dropper tip. Even after cutting a bigger opening in the tip, the toothpaste was getting clogged in the divider. Luckily, you can just invert the dropper tip and when the cap is screwed on, the inverted tip will seat itself into the cap and make a seal with the bottle. This allows you to squeeze the toothpaste out of the bottle without needing to force it through the small dropper tip. 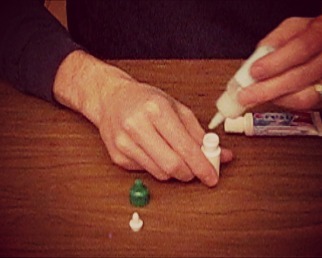 For more details on repackaging toothpaste into dropper bottles, you can also read Brian Green’s post – Eyedropper Bottles: An Ultralighter’s Friend. You can find the dropper bottles online at MountainFitter.com or search on eBay to purchase them in bulk. 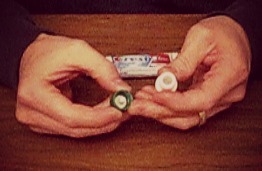 Other ultralight toothpaste ideas include making your own toothpaste dots and using baking soda. I’m not ready to try baking soda just yet (even though it makes sense), but I do have some toothpaste dots curing on my desk as I type this. Look for a toothpaste dot post in the next few weeks. So, you can certainly go camping with a trial size toothpaste, but what’s the fun in that. It’s always more fun to tinker with your kit and come up with ways to save some weight and space with your kit. Have I missed any ways to save weight with toothpaste? If so, leave a comment and share your tip.